Not to be confused with D-xylose isomerase. Functional GPI is a 64-kDa dimer composed of two identical monomers. The two monomers interact notably through the two protrusions in a hugging embrace. The active site of each monomer is formed by a cleft between the two domains and the dimer interface. GPI monomers are made of two domains, one made of two separate segments called the large domain and the other made of the segment in between called the small domain. The two domains are each αβα sandwiches, with the small domain containing a five-strand β-sheet surrounded by α-helices while the large domain has a six-stranded β-sheet. The large domain, located at the N-terminal, and the C-terminal of each monomer also contain "arm-like" protrusions. Several residues in the small domain serve to bind phosphate, while other residues, particularly His388, from the large and C-terminal domains are crucial to the sugar ring-opening step catalyzed by this enzyme. Since the isomerization activity occurs at the dimer interface, the dimer structure of this enzyme is critical to its catalytic function. It is hypothesized that serine phosphorylation of this protein induces a conformational change to its secretory form. 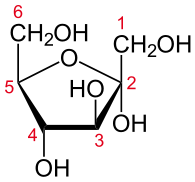 The mechanism that GPI uses to interconvert glucose 6-phosphate and fructose 6-phosphate consists of three major steps: opening the glucose ring, isomerizing glucose into fructose through an enediol intermediate, and closing the fructose ring. Compound C00668 at KEGG Pathway Database. Enzyme 5.3.1.9 at KEGG Pathway Database. Compound C05345 at KEGG Pathway Database. Reaction R00771 at KEGG Pathway Database. Glucose 6-phosphate binds to GPI in its pyranose form. The ring is opened in a "push-pull" mechanism by His388, which protonates the C5 oxygen, and Lys518, which deprotonates the C1 hydroxyl group. This creates an open chain aldose. Then, the substrate is rotated about the C3-C4 bond to position it for isomerization. At this point, Glu357 deprotonates C2 to create a cis-enediolate intermediate stabilized by Arg272. To complete the isomerization, Glu357 donates its proton to C1, the C2 hydroxyl group loses its proton and the open-chain ketose fructose 6-phosphate is formed. Finally, the ring is closed by rotating the substrate about the C3-C4 bond again and deprotonating the C5 hydroxyl with Lys518. This gene belongs to the GPI family. 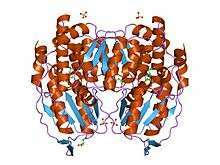 The protein encoded by this gene is a dimeric enzyme that catalyzes the reversible isomerization of G6P and F6P. Since the reaction is reversible, its direction is determined by G6P and F6P concentrations. The protein has different functions inside and outside the cell. In the cytoplasm, the protein is involved in glycolysis and gluconeogenesis, as well as the pentose phosphate pathway. Outside the cell, it functions as a neurotrophic factor for spinal and sensory neurons, called neuroleukin. The same protein is also secreted by cancer cells, where it is called autocrine motility factor and stimulates metastasis. Extracellular GPI is also known to function as a maturation factor. Though originally treated as separate proteins, cloning technology demonstrated that GPI is almost identical to the protein neuroleukin. Neuroleukin is a neurotrophic factor for spinal and sensory neurons. It is found in large amounts in muscle, brain, heart, and kidneys. Neuroleukin also acts as a lymphokine secreted by T cells stimulated by lectin. It induces immunoglobulin secretion in B cells as part of a response that activates antibody-secreting cells. Cloning experiments also revealed that GPI is identical to the protein known as autocrine motility factor (AMF). AMF produced and secreted by cancer cells and stimulates cell growth and motility as a growth factor. AMF is thought to play a key role in cancer metastasis by activating the MAPK/ERK or PI3K/AKT pathways. In the PI3K/AKT pathway, AMF interacts with gp78/AMFR to regulate ER calcium release, and therefore protect against apoptosis in response to ER stress. 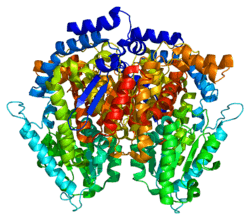 In some archaea and bacteria glucose-6-phosphate isomerase activity occurs via a bifunctional enzyme that also exhibits phosphomannose isomerase (PMI) activity. Though not closely related to eukaryotic GPIs, the bifunctional enzyme is similar enough that the sequence includes the cluster of threonines and serines that forms the sugar phosphate-binding site in conventional GPI. The enzyme is thought to use the same catalytic mechanisms for both glucose ring-opening and isomerization for the interconversion of G6P to F6P. A deficiency of GPI is responsible for 4% of the hemolytic anemias due to glycolytic enzyme deficiencies. Several cases of GPI deficiency have recently been identified. Elevated serum GPI levels have been used as a prognostic biomarker for colorectal, breast, lung, kidney, gastrointestinal, and other cancers. As AMF, GPI is attributed with regulating cell migration during invasion and metastasis. One study showed that the external layers of breast tumor spheroids (BTS) secrete GPI, which induces epithelial–mesenchymal transition (EMT), invasion, and metastasis in BTS. The GPI inhibitors ERI4P and 6PG were found to block metastasis of BTS but not BTS glycolysis or fibroblast viability. In addition, GPI is secreted exclusively by tumor cells and not normal cells. For these reasons, GPI inhibitors may be a safer, more targeted approach for anti-cancer therapy. GPI also participates in a positive feedback loop with HER2, a major breast cancer therapeutic target, as GPI enhances HER2 expression and HER2 overexpression enhances GPI expression, and so on. As a result, GPI activity likely confers resistance in breast cancer cells against HER2-based therapies using Herceptin/Trastuzumab, and should be considered as an additional target when treating patients. 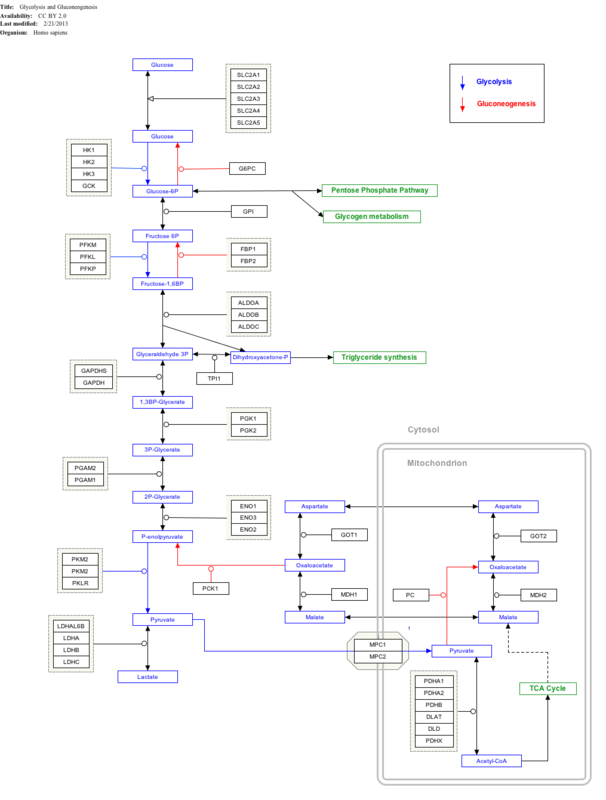 ↑ The interactive pathway map can be edited at WikiPathways: "GlycolysisGluconeogenesis_WP534". 1 2 "Entrez Gene: GPI glucose phosphate isomerase". 1 2 3 Jeffery CJ, Bahnson BJ, Chien W, Ringe D, Petsko GA (February 2000). "Crystal structure of rabbit phosphoglucose isomerase, a glycolytic enzyme that moonlights as neuroleukin, autocrine motility factor, and differentiation mediator". Biochemistry. 39 (5): 955–64. doi:10.1021/bi991604m. PMID 10653639. 1 2 3 4 Haga A, Niinaka Y, Raz A (2000). "Phosphohexose isomerase/autocrine motility factor/neuroleukin/maturation factor is a multifunctional phosphoprotein.". Biochim. Biophys. Acta. 1480 (1-2): 235–44. doi:10.1016/s0167-4838(00)00075-3. PMID 11004567. 1 2 Sun YJ, Chou CC, Chen WS, Wu RT, Meng M, Hsiao CD (May 1999). "The crystal structure of a multifunctional protein: phosphoglucose isomerase/autocrine motility factor/neuroleukin". Proc Natl Acad Sci U S A. 96 (10): 5412–5417. doi:10.1073/pnas.96.10.5412. PMC 21873 . PMID 10318897. 1 2 3 4 5 Cordeiro, AT; Godoi, PH; Silva, CH; Garratt, RC; Oliva, G; Thiemann, OH (21 February 2003). "Crystal structure of human phosphoglucose isomerase and analysis of the initial catalytic steps.". Biochimica et Biophysica Acta. 1645 (2): 117–22. doi:10.1016/s1570-9639(02)00464-8. PMID 12573240. ↑ Read J, Pearce J, Li X, Muirhead H, Chirgwin J, Davies C (June 2001). "The crystal structure of human phosphoglucose isomerase at 1.6 A resolution: implications for catalytic mechanism, cytokine activity and haemolytic anaemia". J Mol Biol. 309 (2): 447–63. doi:10.1006/jmbi.2001.4680. PMID 11371164. ↑ Graham Solomons JT, Zimmerly EM, Burns S, Krishnamurthy N, Swan MK, Krings S, Muirhead H, Chirgwin J, Davies C (September 2004). "The crystal structure of mouse phosphoglucose isomerase at 1.6A resolution and its complex with glucose 6-phosphate reveals the catalytic mechanism of sugar ring opening". J Mol Biol. 342 (3): 847–60. doi:10.1016/j.jmb.2004.07.085. PMID 15342241. 1 2 Kugler W, Lakomek M (March 2000). "Glucose-6-phosphate isomerase deficiency". Baillieres Best Pract. Res. Clin. Haematol. 13 (1): 89–101. doi:10.1053/beha.1999.0059. PMID 10916680. 1 2 3 4 5 Somarowthu, S; Brodkin, HR; D'Aquino, JA; Ringe, D; Ondrechen, MJ; Beuning, PJ (1 November 2011). "A tale of two isomerases: compact versus extended active sites in ketosteroid isomerase and phosphoglucose isomerase.". Biochemistry. 50 (43): 9283–95. doi:10.1021/bi201089v. PMID 21970785. ↑ Dobashi Y, Watanabe H, Sato Y, et al. (December 2006). "Differential expression and pathological significance of autocrine motility factor/glucose-6-phosphate isomerase expression in human lung carcinomas". J. Pathol. 210 (4): 431–40. doi:10.1002/path.2069. PMID 17029220. ↑ Watanabe H, Takehana K, Date M, Shinozaki T, Raz A (1 July 1996). "Tumor cell autocrine motility factor is the neuroleukin/phosphohexose isomerase polypeptide". Cancer Res. 56 (13): 2960–3. PMID 8674049. ↑ Chaput M, Claes V, Portetelle D, Cludts I, Cravador A, Burny A, Gras H, Tartar A (March 1988). "The neurotrophic factor neuroleukin is 90% homologous with phosphohexose isomerase". Nature. 332 (6163): 454–5. doi:10.1038/332454a0. PMID 3352744. ↑ Gurney ME, Heinrich SP, Lee MR, Yin HS (October 1986). "Molecular cloning and expression of neuroleukin, a neurotrophic factor for spinal and sensory neurons". Science. 234 (4776): 566–74. doi:10.1126/science.3764429. PMID 3764429. ↑ Gurney ME, Apatoff BR, Spear GT, Baumel MJ, Antel JP, Bania MB, Reder AT (October 1986). "Neuroleukin: a lymphokine product of lectin-stimulated T cells". Science. 234 (4776): 574–81. doi:10.1126/science.3020690. PMID 3020690. ↑ Watanabe H, Takehana K, Date M, Shinozaki T, Raz A (July 1996). "Tumor cell autocrine motility factor is the neuroleukin/phosphohexose isomerase polypeptide". Cancer Res. 56 (13): 2960–3. PMID 8674049. ↑ Silletti S, Raz A (July 1993). "Autocrine motility factor is a growth factor". Biochem Biophys Res Commun. 194 (1): 454–5. doi:10.1006/bbrc.1993.1840. PMID 8392842. 1 2 3 Fu, M; Li, L; Albrecht, T; Johnson, JD; Kojic, LD; Nabi, IR (June 2011). "Autocrine motility factor/phosphoglucose isomerase regulates ER stress and cell death through control of ER calcium release.". Cell death and differentiation. 18 (6): 1057–70. doi:10.1038/cdd.2010.181. PMID 21252914. ↑ Liotta LA, Mandler R, Murano G, Katz DA, Gordon RK, Chiang PK, Schiffmann E (May 1986). "Tumor cell autocrine motility factor". Proc Natl Acad Sci U S A. 83 (10): 3302–6. doi:10.1073/pnas.83.10.3302. PMID 3085086. 1 2 3 4 Kho, DH; Nangia-Makker, P; Balan, V; Hogan, V; Tait, L; Wang, Y; Raz, A (15 February 2013). "Autocrine motility factor promotes HER2 cleavage and signaling in breast cancer cells.". Cancer Research. 73 (4): 1411–9. doi:10.1158/0008-5472.can-12-2149. PMID 23248119. ↑ Swan MK, Hansen T, Schonheit P, Davies C (September 2004). "A novel phosphoglucose isomerase (PGI)/phosphomannose isomerase from the crenarchaeon Pyrobaculum aerophilum is a member of the PGI superfamily: structural evidence at 1.16-A resolution". J. Biol. Chem. 279 (38): 39838–45. doi:10.1074/jbc.M406855200. PMID 15252053. ↑ Walker JI, Layton DM, Bellingham AJ, Morgan MJ, Faik P (March 1993). "DNA sequence abnormalities in human glucose 6-phosphate isomerase deficiency". Hum. Mol. Genet. 2 (3): 327–9. doi:10.1093/hmg/2.3.327. PMID 8499925. ↑ Kanno H, Fujii H, Hirono A, Ishida Y, Ohga S, Fukumoto Y, Matsuzawa K, Ogawa S, Miwa S (September 1996). "Molecular analysis of glucose phosphate isomerase deficiency associated with hereditary hemolytic anemia". Blood. 88 (6): 2321–5. PMID 8822954. ↑ Gallardo-Pérez, JC; Rivero-Segura, NA; Marín-Hernández, A; Moreno-Sánchez, R; Rodríguez-Enríquez, S (June 2014). "GPI/AMF inhibition blocks the development of the metastatic phenotype of mature multi-cellular tumor spheroids.". Biochimica et Biophysica Acta. 1843 (6): 1043–53. doi:10.1016/j.bbamcr.2014.01.013. PMID 24440856. Walker JI, Faik P, Morgan MJ (1990). "Characterization of the 5' end of the gene for human glucose phosphate isomerase (GPI).". Genomics. 7 (4): 638–43. doi:10.1016/0888-7543(90)90212-D. PMID 2387591. Brownstein BH, Silverman GA, Little RD, et al. (1989). "Isolation of single-copy human genes from a library of yeast artificial chromosome clones.". Science. 244 (4910): 1348–51. doi:10.1126/science.2544027. PMID 2544027. Mizrachi Y (1989). "Neurotrophic activity of monomeric glucophosphoisomerase was blocked by human immunodeficiency virus (HIV-1) and peptides from HIV-1 envelope glycoprotein.". J. Neurosci. Res. 23 (2): 217–24. doi:10.1002/jnr.490230212. PMID 2547084. Gurney ME, Apatoff BR, Spear GT, et al. (1986). "Neuroleukin: a lymphokine product of lectin-stimulated T cells.". Science. 234 (4776): 574–81. doi:10.1126/science.3020690. PMID 3020690. Faik P, Walker JI, Redmill AA, Morgan MJ (1988). "Mouse glucose-6-phosphate isomerase and neuroleukin have identical 3' sequences.". Nature. 332 (6163): 455–7. doi:10.1038/332455a0. PMID 3352745. Zanella A, Izzo C, Rebulla P, et al. (1981). "The first stable variant of erythrocyte glucose-phosphate isomerase associated with severe hemolytic anemia.". Am. J. Hematol. 9 (1): 1–11. doi:10.1002/ajh.2830090102. PMID 7435496. Faik P, Walker JI, Morgan MJ (1994). "Identification of a novel tandemly repeated sequence present in an intron of the glucose phosphate isomerase (GPI) gene in mouse and man.". Genomics. 21 (1): 122–7. doi:10.1006/geno.1994.1233. PMID 7545951. Xu W, Beutler E (1995). "The characterization of gene mutations for human glucose phosphate isomerase deficiency associated with chronic hemolytic anemia.". J. Clin. Invest. 94 (6): 2326–9. doi:10.1172/JCI117597. PMC 330061 . PMID 7989588. Xu W, Lee P, Beutler E (1996). "Human glucose phosphate isomerase: exon mapping and gene structure.". Genomics. 29 (3): 732–9. doi:10.1006/geno.1995.9944. PMID 8575767. Baronciani L, Zanella A, Bianchi P, et al. (1996). "Study of the molecular defects in glucose phosphate isomerase-deficient patients affected by chronic hemolytic anemia.". Blood. 88 (6): 2306–10. PMID 8822952. Beutler E, West C, Britton HA, et al. (1998). "Glucosephosphate isomerase (GPI) deficiency mutations associated with hereditary nonspherocytic hemolytic anemia (HNSHA).". Blood Cells Mol. Dis. 23 (3): 402–9. doi:10.1006/bcmd.1997.0157. PMID 9446754. Kanno H, Fujii H, Miwa S (1998). "Expression and enzymatic characterization of human glucose phosphate isomerase (GPI) variants accounting for GPI deficiency.". Blood Cells Mol. Dis. 24 (1): 54–61. doi:10.1006/bcmd.1998.0170. PMID 9616041. Kugler W, Breme K, Laspe P, et al. (1998). "Molecular basis of neurological dysfunction coupled with haemolytic anaemia in human glucose-6-phosphate isomerase (GPI) deficiency.". Hum. Genet. 103 (4): 450–4. doi:10.1007/s004390050849. PMID 9856489. Belyaeva OV, Balanovsky OP, Ashworth LK, et al. (1999). "Fine mapping of a polymorphic CA repeat marker on human chromosome 19 and its use in population studies.". Gene. 230 (2): 259–66. doi:10.1016/S0378-1119(99)00056-6. PMID 10216265. Yakirevich E, Naot Y (2000). "Cloning of a glucose phosphate isomerase/neuroleukin-like sperm antigen involved in sperm agglutination.". Biol. Reprod. 62 (4): 1016–23. doi:10.1095/biolreprod62.4.1016. PMID 10727272. Haga A, Niinaka Y, Raz A (2000). "Phosphohexose isomerase/autocrine motility factor/neuroleukin/maturation factor is a multifunctional phosphoprotein.". Biochim. Biophys. Acta. 1480 (1-2): 235–44. doi:10.1016/s0167-4838(00)00075-3. PMID 11004567.